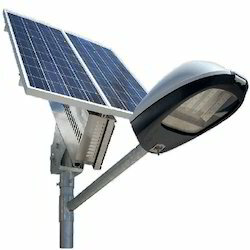 Offering you a complete choice of products which include solar led street light. SUNLIT LED street lights / Bay lights can replace Sodium Vapour street light. It's driven by a universal direct driver which makes it run on input voltage 160V -265V. It has very good efficiency, power factor, and a THD less than 20%. It has an indigenously designed Cast Aluminum Fixture which also acts as a heat - sink enabling faster heat dissipation and longer LED life. It has very high CRI. In comparison with sodium vapor, LED street light saves more than 70% of energy.